This is an intriguing passage on several levels. I have prayed and chewed on it for the last day or so. I am still not sure I have a clue what is hidden in the depths of this passage. The passage describes in some detail the male figure talking about his love for the female figure. He does this in a way many men would love to be able to emulate….”how delightful is your love, my sister, my bride! How much more pleasing is your love than wine, and the fragrance of your perfume more than any spice!”. This is raw passionate and intimate love. Physical love is more implied than specifically mentioned. It comes with the first water reference, “You are a garden locked up, my sister, my bride; you are a spring enclosed, a sealed fountain.” It sounds to me like this is referring to the virtue of the bride, her chastity. She has “locked up” her virtue for only the bridegroom to share and no one else. This is a good thing and I think it is the way God intended us to share this most intimate part of our physical bodies. So although she clearly is a very desireable woman who he later compares to “a well of flowing water streaming down from Lebanon” she has “enclosed her spring” for him. If she locks up her “spring” so tightly that she is unable to unlock it for her lover when the time and place is appropriate that is a problem. This passage holds special meaning for me as a result of the work I do with water in Haiti. 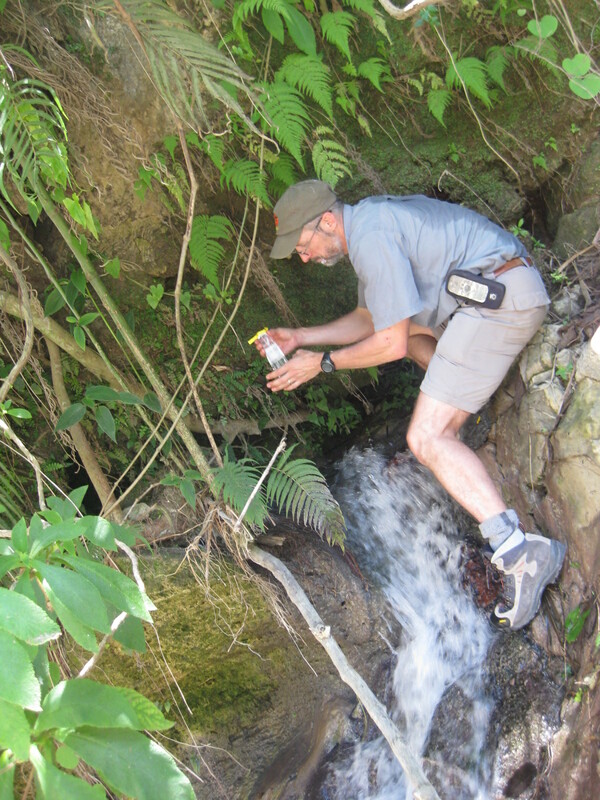 In Haiti springs are contaminated with pathogens (bacteria, viruses, and parasites). Although they look clean they are often unsafe to drink. One of the ways people have attempted to solve this problem is to cover the spring – “enclose it” in a concrete box called a spring cap to protect the water from contamination. In principle this is a sound idea as animals often visit the spring and defecate near the spring causing contamination. It turns out that in Haiti the limestone rock is riddled with cavities and open cracks so that it looks a little like swiss cheese. The end result is that water in springs is often contaminated not where it emerges from the ground but sometimes 100’s of meters away — enclosing it at the place it emerges does not work to prevent contamination. So given that context and background about springs what can we learn about our relationship with God from this passage. If we take this passage to be an allegory the man would be God or Christ; and the woman is either the Israelites or the Church (modern day Christ followers). The bridegroom (God or Christ) seems to be telling the Israelites and the Church that they have “enclosed the spring”. They have boxed up the living water God has provided. They may have done this for good reasons, i.e. to prevent “contamination” and protect their virtue, but the end result is that they have isolated themselves from the people around them that need some of the living water they possess. What God seems to be saying is that both the Israelites, and by implication the modern Church, is that they have have dammed up the “well of flowing water streaming down from Lebanon”. They are not using the gifts and fruit of their intimate relationship with God to find and care for the lost sheep around them. In the case of the Isrealites this looked like Pharisaic extremism, and for the modern Church it looks like liturgical legalism. Both the Isrealites and modern day Christ followers have been given a special gift from God. An intimate relationship that I believe is unique and exclusive, just like the physical relationship between a husband and wife. In one of the many paradoxes in the bible it seems this exclusive relationship was meant to be shared. He wants our love for Him to be intimate and passionate, just as He loves us intimately and passionately; but God wants us to share the living water He provides with others. He does not want us to “enclose the spring”. This passage is an interesting stretch of river — deep water to be sure. I may have gotten it all wrong, but I am pretty sure God loves me anyway. Prayer: God You love us with passion and intimacy. Help us to both protect this exclusive relationship and share it with others. This entry was posted in Christian Community, Christian Leadership, Christianity, Covenant, Discernment, Following God, Free Will, God's Love for Us, Haiti, Life Together, religion, Sin, Song of Solomon, The Nature of God, Wisdom and tagged bible, bible study, chastity, christian marriage, Christianity, Daily devotional, Haiti, marriage, spring, virtue, water. Bookmark the permalink.